A very primitively evil looking mask from Clive Barker‘s Nightbreed (1990) that strikes fear in viewers due to the twisted nature of the mask. Nightbreed is filled with creepy looking monsters, but that does not compare with the human [secret face] serial killer mask known as the Buttonface mask of the movies’ surprising villain. Synopsis: A community of mutant outcasts of varying types and abilities attempts to escape the attention of a psychotic serial killer and redneck vigilantes with the help of a brooding young man who discovers them. Based on the novel "Cabal" by Clive Barker. 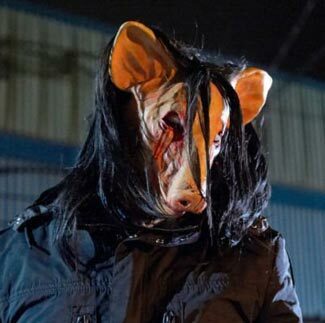 The pig mask comes from the Saw franchise that at first sounds underwhelming, but the skewed image of the pig face makes the mask unnerving. Jigsaw and his accomplices wear this mask to hide their identities. The pig represents the zodiac year in which the killer Jigsaw began his killings. Synopsis: Waking up in a undisclosed location in a unknown room two men, adam and gordon are trapped into a single room with a dead body. Given random tools with riddles hidnen around the room. Wondering who could have done this there are clues to who might of done it; the jigsaw killer. The question is not just who but why would a serial killer leave two men in a room. Both adam and gordon hiding secrets they must trust and work together to get out or die...can they survive Jigsaw's game or die trying? 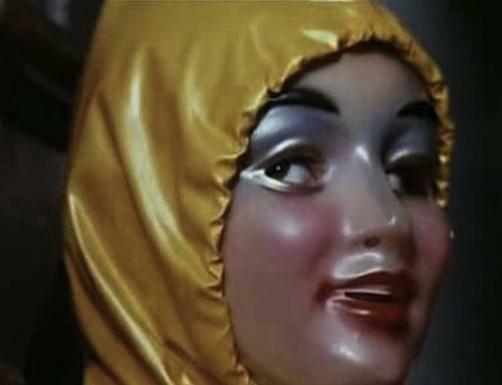 Not the scariest mask in the list but compounded with the fact that a homicidal maniac is looking behind that pale face with horrible makeup and a huge smile does make this Mrs. Tredoni mask from Alice, Sweet Alice (1976), aka Communion (1976), stand out a bit. Synopsis: Alice Spages is a withdrawn 12 year old girl who lives with her mother, Catherine, and her younger sister, Karen. Karen gets most of the attention from her mother, and Alice is often left out of the spotlight. But when Karen is found brutally murdered in a church before her first holy communion, all suspicions are turned towards Alice. But is a twelve year old girl really capable of such savagery? As more people begin to die at the hands of a merciless killer, Alice's family and the police don't know what to believe. 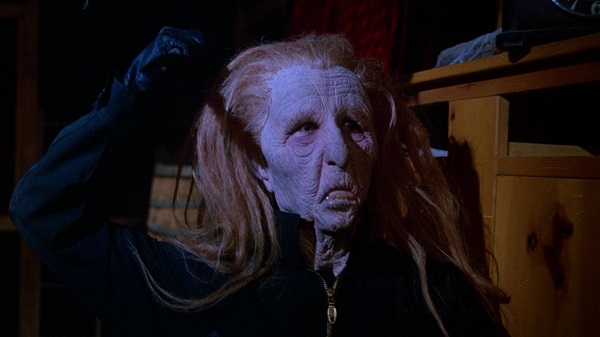 The hag mask from Curtains (1983) takes a standard old hag mask and elevates the idea by making the competition for a part in a movie, kill other competitors in order to sinisterly gain the lead role. Someone wants to be an actress at any cost. Synopsis: Samantha Sherwood has worked with the well-known director Jonathan Stryker on all his major films. She naturally assumes she has been given the title role in his latest venture, "Audra". He tells her that she nn needs to do some background research on the part, so arranges to have her committed to an asylum (as Audra is a former psychiatric patient). She goes along with this, not realising that he intends to leave her there indefinitely and audition six young women of various professions for the part instead. She finally manages to escape, and returns to the spooky old mansion where the auditions are taking place. But who is causing the disappearances of the young hopefuls?? Is it Samantha? Stryker? Or is one of the actresses willing to kill for the coveted part?? Just who is the killer behind the old-hag mask??? The Babyface Killer‘s mask from The Hills Run Red (2009) is awesomely frightening and scary. The killer in this horror film cut off his face and stitched on the mask. The porcelain upper half combined with the shattered human jaw makes this one of the most scariest masks on the list easily. Did I mention that the mask is also held on by barbed wire? Synopsis: Tyler is obsessed by the horror movie "The Hills Run Red", considered by those that had seen it the scariest movie ever made, with the deranged serial-killer Babyface in the lead role. However, the director Wilson Wyler Concannon and the movie vanished many years ago and there is no available print. His research is affecting his relationship with his girlfriend Serina that is needy and feels neglected. When Tyler discovers that Concannon's daughter Alexa works in a night-club, he decides to meet her and asks about the missing movie. The woman tells that the movie might be in her father's house in the middle of the woods, and Tyler decides to travel to the spot with Alexa, Serina and their friend Lalo. Along their journey, Tyler films and interviews some locals. During the night, they are attacked by the rednecks, but they are saved by Babyface that kills the assaulters and is controlled by Alexa that runs away from him. Tyler, Serina and Lalo get rid off the ropes, but Tyler decides to help Alexa, disclosing fate of the movie. 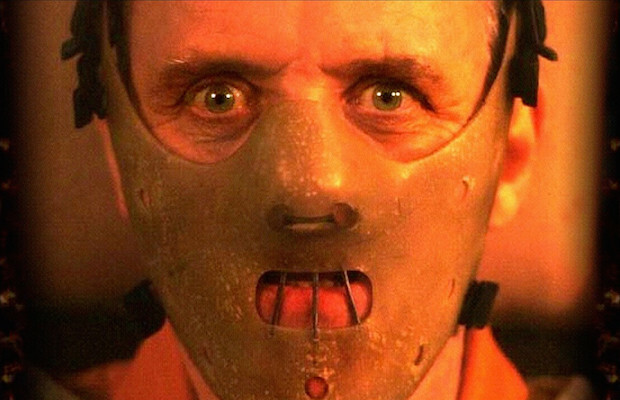 Yes, the Anthony Hopkins version of Hannibal Lecter from The Silence of the Lambs (1991) is one of the simpler masks, but also one of the most iconic. The mask was used to protect the guards from the cannibal Hannibal Lecter trying to bite off pieces of them within seconds of being near him. Hannibal Lecter is both unbelievably smart and uncharacteristically animalistic making him a very dangerous and unpredictable character. Synopsis: FBI trainee Clarice Starling works hard to advance her career, while trying to hide/put behind her West Virginia roots, of which if some knew, would automatically classify her as being backward or white trash. After graduation, she aspires to work in the agency's Behavioral Science Unit under the leadership of Jack Crawford. While she is still a trainee, Crawford asks her to question Dr. Hannibal Lecter, a psychiatrist imprisoned, thus far, for eight years in maximum security isolation for being a serial killer who cannibalized his victims. Clarice is able to figure out the assignment is to pick Lecter's brains to help them solve another serial murder case, that of someone coined by the media as Buffalo Bill, who has so far killed five victims, all located in the eastern US, all young women who are slightly overweight (especially around the hips), all who were drowned in natural bodies of water, and all who were stripped of large swaths of skin. She also figures that Crawford chose her, as a woman, to be able to trigger some emotional response from Lecter. After speaking to Lecter for the first time, she realizes that everything with him will be a psychological game, with her often having to read between the very cryptic lines he provides. She has to decide how much she will play along, as his request in return for talking to him is to expose herself emotionally to him. The case takes a more dire turn when a sixth victim is discovered, this one from who they are able to retrieve a key piece of evidence, if Lecter is being forthright as to its meaning. A potential seventh victim is high profile Catherine Martin, the daughter of Senator Ruth Martin, which places greater scrutiny on the case as they search for a hopefully still alive Catherine. Who may factor into what happens is Dr. Frederick Chilton, the warden at the prison, an opportunist who sees the higher profile with Catherine, meaning a higher profile for himself if he can insert himself successfully into the proceedings. 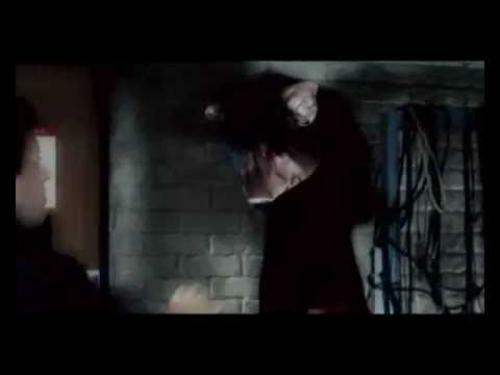 The Ghostface mask practically screams "you’re gonna die" whenever you saw it in the movie. 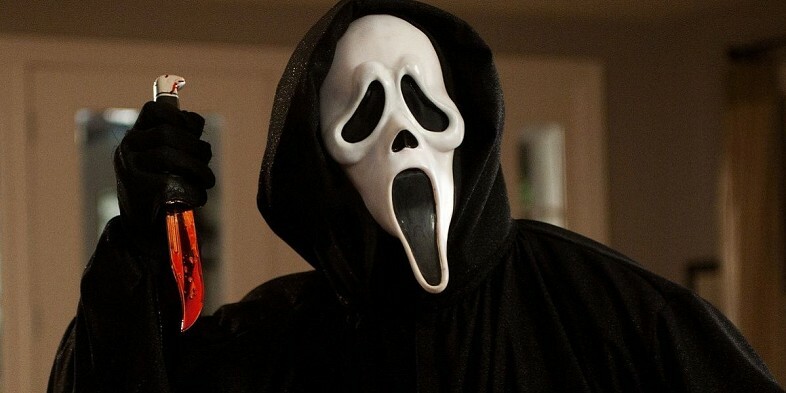 Wes Craven created the Scream franchise, and the Ghostface mask blew up to massive proportions. After Scream (1996) had released, Ghostface was a favorite costume at every Halloween event/party for many years to come. Synopsis: A year after her mother's death, Sydney Prescott (Neve Campbell), and her friends started experiencing some strange phone calls. They later learned the calls were coming from a crazed serial killer, in a white faced mask and a large black robe, looking for revenge. His phone calls usually consist of many questions, the main one being: Whats your favorite scary movie? Along with many scary movie trivia, ending with bloody pieces of innocent lives scattered around the small town of Woodsboro. 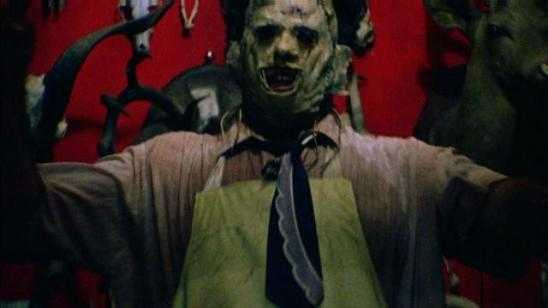 The Leatherface mask gets its name from the fact that it is made from the human skin of Leatherface’s victims. If that were not enough, Leatherface’s massive size and chainsaw wielding mayhem would cause even the toughest man to cower and flee in terror. Leatherface can be found in The Texas Chain Saw Massacre franchise. The Michael Myers mask is another of the most iconic horror movie masks because Michael Myers is a serial killer who possesses abnormal human strength. Michael Myers is the killer that keeps on killing. The pale face mask does a terrific job of making the viewers’ blood run cold whenever Michael Myers appears. Synopsis: The year is 1963, the night: Halloween. Police are called to 43 Lampkin Ln. only to discover that 15 year old Judith Myers has been stabbed to death, by her 6 year-old brother, Michael. 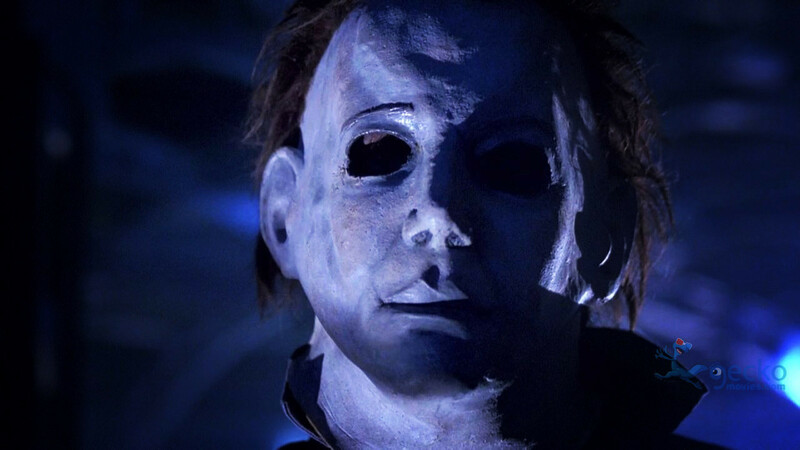 After being institutionalized for 15 years, Myers breaks out on the night before Halloween. No one knows, nor wants to find out, what will happen on October 31st 1978 besides Myers' psychiatrist, Dr. Loomis. 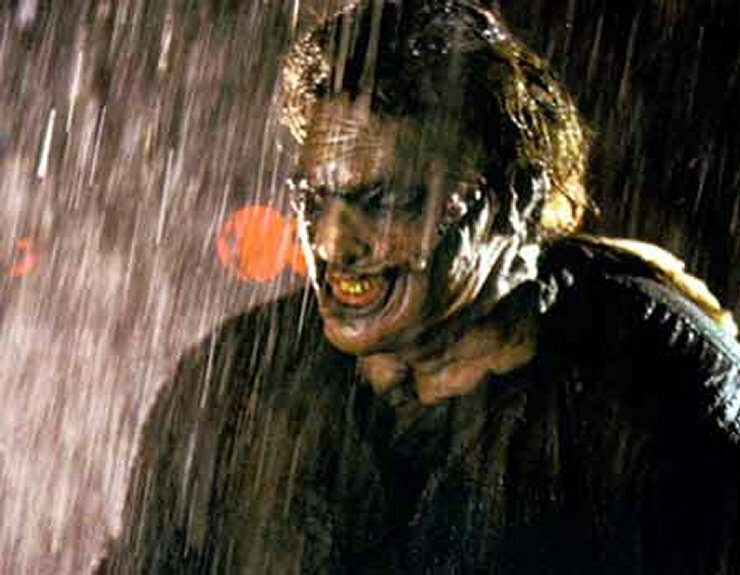 He knows Michael is coming back to Haddonfield, but by the time the town realizes it, it'll be too late for many people. 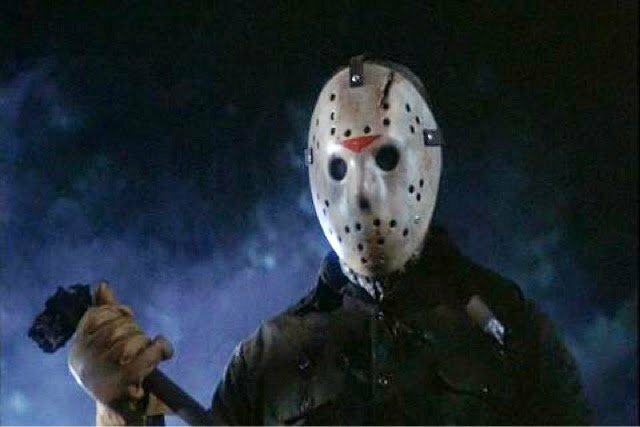 The Friday the 13th movie franchise spurned the villainous Jason Voorhees, who terrorizes the summer camp near Crystal Lake behind a hockey mask. Jason came back from the dead to wreak havoc as an unstoppable killing force who has been shot, stabbed, anchored to the bottom of Crystal Lake, and was even blown to pieces. Kane Hodder gets the most credit for playing the iconic horror icon. Synopsis: One summer at Camp Crystal Lake, a group of young counselors begin to get ready to lead campers. Unfortunately for the former, someone isn't happy about what's going on in the camp and enjoys playing kill the counselor. As bodies fall to the ground in the camp, no one is safe.